Queensville has great expectations for their Dickens Days festival. A tourist-trade boon boom means a big turnout for the opening of Queensville Historic Manor and for Jaymie Leighton, food columnist and vintage cookware collector, a chance to promote the manor and give away homemade goodies. At the end of a long day of festival fun, Jaymie discovers the battered body of local woman Shelby Fretter. Victoria Hamilton is a pseudonym for national bestselling author Donna Lea Simpson, who is also a collector of vintage cookware and recipes. 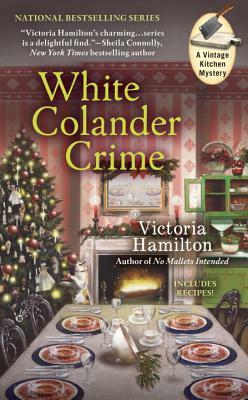 Hamilton is the author of the Vintage Kitchen mysteries including No Mallets Intended.